English - Benvenuti su poggiodisole! If you find the idea of combining sea air and the countryside together enticing, then Poggio di Sole is... your house. An old Tuscan farmhouse on the Island of Elba, built in stone and entirely renovated in 2002 with environmentally friendly materials and techniques. It is in the small town of Lacona, in the Capoliveri municipality, on the southern side of the island and therefore offers a particularly mild climate even during the winter months. The farmhouse is divided into 4 apartments (1 studio, 2 two-room apartments and 1 three-room apartment) – all furnished with taste and furniture in solid chestnut, in the traditional style of Tuscan countryside rural mansions. Each apartment has an independent entrance, a fully-equipped kitchenette with a microwave, tv, heating and bathroom with shower. It is easily reached by car in 15 minutes from the Ferry at Portoferraio. 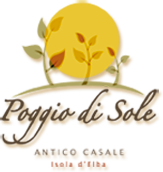 Poggio di Sole dominates the sea from a hilltop and has a privileged view over the gulf of Lacona and the gulf of Stella. When the Mistral opens up the horizon the view also opens up on the islands of Montecristo and Giglio. It is surrounded by 6000 sq m of vegetation and amidst secular olive and pine trees there are pouffe and sun loungers for your moments of relax.